Many people view marketing as a special talent reserved only for the gifted few entrepreneur, or perhaps as an unattainable “black magic” of the business world. A world of lies, secrets and psychological manipulation conjured to deceive and persuade by playing on people’s deepest emotions and desires. The purpose and result of which allows one to pull the strings in a world that transforms ordinarily rational and reasonable people into living, breathing automatons, hypnotized into taking subconscious action against their will. While these definitions are nuanced and highly individual, they do share a common element – influence. Influence is at the heart of all great marketing efforts. It’s the pull, rather than the push. It’s the “X Factor” that determines the ultimate success of a marketing campaign. Influence is the logical end, after all, it’s what drives behaviour. Again, ask a hundred marketers and you’ll receive a hundred answers. So, in the interest of effectiveness and efficiency, let’s visit the illuminating world of TED Talks for three key speakers whose lessons in marketing, all combined, create a solid basis for any marketing philosophy. As these experts illustrate, marketing need not be complicated. It’s simply a matter of focusing on a small number of key principles that can ultimately influence action. In this TED Talk, Sutherland discusses the importance of framing / reframing and drops insights left and right, but perhaps his biggest insight is his description of goal dilution. This refers to the marketing magic phenomenon where people believe that someone who is known for doing only one thing (i.e. a niche specialist) will be better at that thing than someone who does more than one thing. He offers the classic example of Google, a company that does one thing – it’s a search engine, and as we all likely believe, the best one. There’s a reason why McDonald’s doesn’t serve gourmet food. There’s a reason why Las Vegas doesn’t advertise itself as ‘family friendly.“ There’s a reason why Harley Davidson doesn’t manufacture cars. These brands do one thing, and by association, it’s assumed they do it well. As the saying goes, “Dance with who brought you to the ball.” Try and be all things to all people and you end up being nothing to anyone. After you watch this TED Talk, you will have ideas on the value of framing your business. Simon Sinek teaches us that when people believe what you believe, they will take your cause and make it their own! Therefore, if you tell the world what you believe, you will inspire masses to listen to you. In this TED Talk, Sinek introduces the concept of the “Golden Circle.” In short, Sinek thought that connecting with a group like-minded people came down to believing the same thing. He referred to this as the “Why” of an organization. The premise was simple; Tell people what you believe and those that believe the same things as you will follow. As part of the equation, he made the case that most of the marketing we see daily has it backwards. A very recent, and personal example which proves the power of this concept / immutable law, is shown in a recent video post on Facebook by my friend, Robb Scott, that went absolutely viral and has been seen by over a million in under a week and continues to grow worldwide as we read. In case you are one of the 8 or so remaining people in North America who hasn’t seen this yet, I will give some background. Robb lives in Truro, Nova Scotia. He has a son with Down Syndrome. 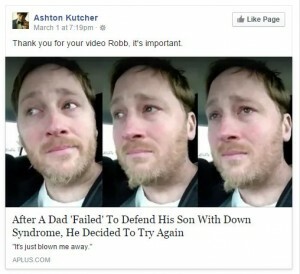 In the video, he describes a day in early February, 2016 where he was in a video store and overheard a son asking his father what Down Syndrome is [referring to a movie about a boy with Down Syndrome]. The father, after searching his soul for the right answer, told his son that it was an “illness, … of not knowing anything”. This hit home with Robb, and caught off guard, he felt an urge to speak up, but for one reason or another he didn’t. This affected him in an emotional way and he left the store, got in his car, turned on his iPhone and began to pour his heart out. Right there in the parking lot, he made an emotional video confessing what he described as having just failed his son. Down Syndrome is] to grow in another generation.” And that in not speaking up he believed he ‘failed his son’. His reason for making the video was to hopefully reach out to a few people, in an effort to regain some “karma” for his self-described failure in not saying anything. Robb went on to tell us what Down Syndrome is. He said it is beautiful, fun, brilliant, kind, loving cuddly, people with Down Syndrome are great teachers. He went on to say that he believes ‘it is not an illness or even a disability’. Rob said that Down Syndrome was ‘literally’, the best thing that ever happened to him. So, instead of focusing on what you do, as company’s traditionally do, focus on “WHY” you do it, and see how this changes your business. Seth Godin has much wisdom to share in this talk, but one point stands out – it’s the concept of “idea diffusion,” or, how to get your ideas to spread. Having ideas spread like wildfire is the holy grail for marketers. It’s the reason they do what they do. An idea that spreads is one that builds influence. Godin is clear with his advice. To gain traction, to take flight, a campaign needs to be one thing and one thing only – remarkable. If it’s remarkable, people will notice. Being remarkable is why topics trend on Facebook. Being remarkable is why videos go viral on Youtube. Doing something so unique, so “out there,” that people will be forced to stand up and take notice. Think of Richard Branson. He may be king of the remarkable. Over the years he’s done many things to make him stand out from the crowd; kite surf across the English Channel, crossing the English Channel in an amphibious car, jumping off the Palms Hotel and Casino or driving an armored vehicle down 5th Avenue in New York. While some of these “stunts” may not have been directly related to what the Virgin Group does, they certainly kept them, and Sir Richard, front of mind. What about Red Bull? Famous for being the ultimate sponsor of extreme sports? Red Bull has gone far beyond the conventional to get its name to spread. You’ve no doubt seen Red Bull linked to Felix Baumgartner’s space jump, Formula 1 racing, the Winter X Games, an Alpha Jet flight demonstration team, among many others. Virgin and Red Bull are both remarkable, and through their actions they spread company philosophies that challenge the status quo, and push the boundaries of the conventional. Stick with these and see what happens!